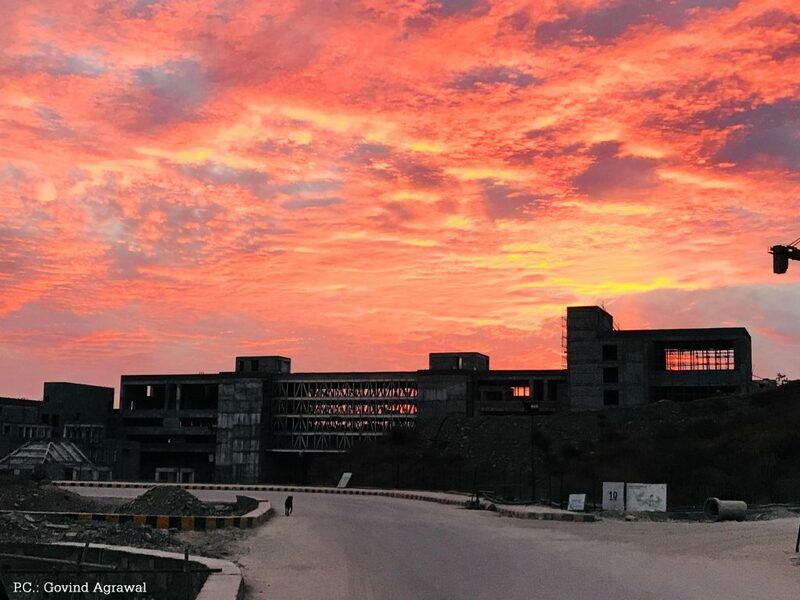 Built amidst the Aravali ranges, IIM Udaipur was one of the first new IIMs to have its own campus. It is the biggest campus with an area of 330 acres and is one of the most beautiful campuses of India. Apart from the beauty, natural surrounding and calm (as it is far away from the hustle and bustle of the city), the various amenities, the faculties, and the students provide it with its real charisma. A normal day in IIM Udaipur starts with students running towards the mess for their breakfast and then to their respective classes as punctuality is taken very seriously here. Everyone gathers around in the mess during the lunch time, sharing stories and laughing while some also talk about the various strategies and case studies taught in the classes. As the evening comes, you can see people cycling through the Aravali ranges, taking pictures of the beautiful sky and sunsets, or just sitting and watching the serene and infinite green mountains. The day is filled with various sports activities like table tennis, badminton, volleyball, football, basketball, cycling, and cricket. Along with the extracurricular activities, the students of IIM U have learned the art of perfect time management and balance out the time between these activities and case studies, pre-reads, assignment submissions, projects, quizzes, and exams. The amenities provided by IIM U to the students makes learning and developing on a personal level possible for them. These amenities include convenience and comfort of living, the helpful housecleaning service, shuttles for connectivity between the IIM U College and the city, night canteens, and medical services. On an academic point of view, due to the ease of connectivity from the airport and railway station to IIM U, we have various high profile visiting faculties regularly coming to the campus to impart their knowledge to the students. Many workshops and seminars also witness great industry experts and professionals. During the nights, you will not find any hostel completely dark, someone or the other is always up – reading, painting, playing the guitar, and sometimes just wondering what life would be once we leave this beautiful place. The people of IIM U have the most lively spirits, be it the college appointed, kind counselor who has her door open to students in stress, or be it the loving lady Doctor on campus, the welcoming hostel wardens who always smile and wish you a good morning or the cleaning staffs who always ask you about your health and life. IIM Udaipur is a world in itself and you really won’t be the right fit unless you are ready to walk in with an open heart and mind and ready to take up all the challenges thrown at you with a smile. I would like to work for “Aditya Birla Retail Limited” which sells FMCG products to the consumers required for daily chores. The primary reason for working here is because of the concept which divides the sector into two halves which is Supermarket and Hypermarket. Supermarkets are the one which is located in the neighbourhood while Hypermarkets are a One-Stop Shopping Destination having a wide range of products. ARBL provides a great learning opportunity through institutes like Aditya Birla Center for Retail Excellence and Gyanodaya. Also, there are other initiatives such as SPARK, Aarohan, and Aarambh which help to imbibe ARBL’s Quality First philosophy. The X-Journey: What Makes XIMB Unique?